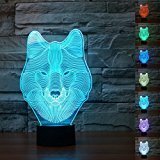 3D Animal Wolf Night Light 7 Color Change LED Table Desk Lamp Acrylic Flat ABS Base USB Charger Home Decoration Toy Brithday Xmas Kid Children Gift by FXUS at Animal Backgrounds. MPN: 10423486. Hurry! Limited time offer. Offer valid only while supplies last. Description: 3D vision effect, especially in the dark or take a photograph,PMMA acrylic is not glass, the whole board is solid acrylic material.